rodney alexander is a congressman who admits on radio that he doesnt have enough sense to do his job but because he delivers the 'earmarks' (with money borrowed from china) no one will speak out against him and everyone looks the other way. liars and shills like moon griffon never question congressman alexander and in fact give him a platform. don cazayoux, we warned before the election that all he is, is a pathetic zionist puppet. Introduced less than a month ago, Resolution 362, also known as the Iran War Resolution, could be passed by the House as early as next week. The bill is the chief legislative priority of AIPAC. 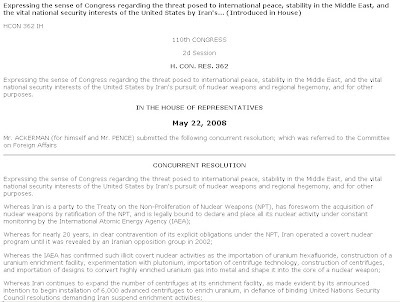 On its Web site, AIPAC endorses the resolutions as a way to ”Stop Iran’s Nuclear Program” and tells readers to lobby Congress to pass the bill. In the Senate, a sister resolution, Resolution 580, has gained co-sponsors with similar speed. The Senate measure was introduced by Indiana Democrat Evan Bayh on June 2. It has since gained 19 co-sponsors. “Imposing stringent inspection requirements on all persons, vehicles, ships, planes, trains, and cargo entering or departing Iran” can be read to mean that the president should initiate a naval blockade of Iran. A unilateral naval blockade without UN sanction is an act of war. 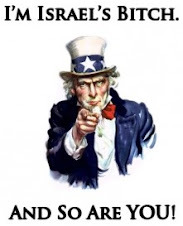 I hear members of Congress saying 'if we could only nuke Iran'." "If we do (attack) it is going to be a disaster,"
"I was astounded to see on one of the networks the other day that the debate was not are we going to attack? but are we going to attack before or after the election?" Paul continued. The Congressman recently voiced his concern over House Congressional Resolution 362 which he has dubbed a 'Virtual Iran War Resolution'. "If that comes up it is demanding that the President put on an absolute blockade of the entire country of Iran, and punish any country or any business group around the world if they trade with Iran." Paul told listeners. Experts have predicted gas will rise to $6 per gallon if the resolution passes, Paul believes that may happen anyway just by anticipation. "The frightening thing is they say they are taking no options off the table, even nuclear first strike." The Congressman stated. Paul believes from talking with his contacts in and around Congress that a strike on Iran has already been green lighted.